I'm not the most active person in the world when it comes to keeping fit. In fact, that's quite an understatement! I used to be quite fit in my early teen years, but then I hit 17, got a car, and promptly sat on my arse for most of the day Haha! There was a brief spell during my art college days though, where I would zip about between college and my student house on a micro scooter. I know what you're thinking... grown ups don't use micro scooters! Well two things... Firstly, who says I've ever really grown up? 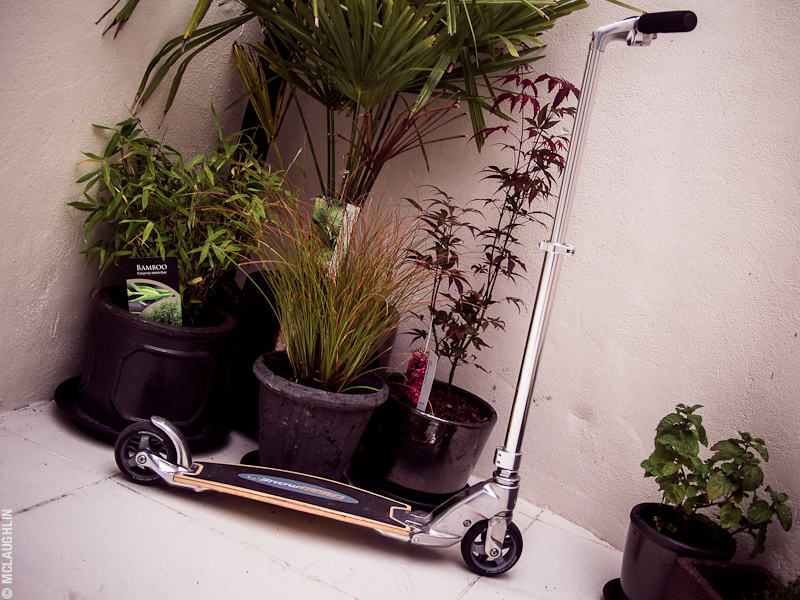 And secondly, my micro scooter was for grown up sized people! So nerr! This "Freshmove 200" scooter was supposed to be the next big thing in "urban mobility" and features a flexible oak deck, ABEC 7 bearings, a gravity cast aluminium chassis and wider wheels for increased stability at speed. As far as scooters go, this is no kids toy, and seeing as the company went bust and ceased production, I kept hold of it in it's carry bag. Despite holding onto my scooter instead of throwing it out, I haven't actually used it since I was actually at art college! The car always seemed like a much easier option for getting about. Of course, now I'm living in East London I no longer have a car. And like half the other sheep I've seen up and down my road, trying to get fit after being put to shame by both the Olympics and Paralympics, I thought I should probably do something to at least break a sweat! So tonight, as a result of needing to meet someone in Bethnal Green, I thought I'd get my scoot on! To my delight, scooting, it transpires, is much like riding a bike. It was just as easy as I remember, and despite my lack of general fitness, I was was able to get a good pace going. On my way to Bethnal Green, I stepped outside my flat, just as the bus drove past, so decided to try and beat it to my destination. To my shock, I actually managed to do it too! Probably on account of not having done any form of exercise in about 3 years, there was a brief moment about 15 mins after getting to Bethnal Green where I thought I was about to pass out, but I didn't, so all is good. On the way back, I went at a more leisurely pace, although I still made good time. I'm not going to make any outlandish statements like "I'm going to go everywhere on my micro scooter", or "I'm now going to start a keep fit regime", because that would just be silly. I am, however, going to try and make an effort to at least shoot about on it locally, if not further from time to time. For a start, it's quicker than walking!